Located in Sindorim Station Seoul, Seelaw Academy has fostered talented legal professionals who are now working in various law firms and private companies big or small. For the last 5 years, the academy has harvested outstanding fruits by fostering and placing more than yearly 1,000 highly trained legal professionals to the industries with great satisfaction rate. 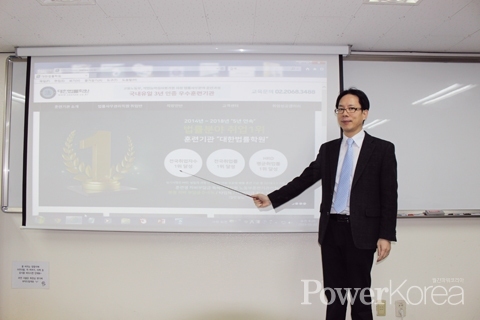 In recognition, the academy was chosen as an excellent training institute from the Ministry of Employment and Labor on which it has provided special lectures on employment rate for 2 years at the Korea Employment Information Service Southern Seoul; the principal Yang Sang-won received an appreciation plaque at the end of the course. Taking the momentum, the academy expanded its career guide at various universities to encourage students on legal professions. This confidence of the academy has come from its unparalleled achievement that is keeping the No.1 status in both employment rate and satisfaction rate for 5 years in a row since 2014 which also brought the academy a 3 year certification as an excellent training institute from the Ministry of Employment and Labor. It is notable that at Seelaw Academy students only need to pay 0 to 5% tuition fee (normally more than 15%) for quality training. In other words, students can save more than 160,000 won (USD$142). “The principal of job training institutes must take a great responsibility since the system is run by taxpayer’s money. In other words, principals and teachers must do their best to make sure that not a single student fails to get a job after training” says principal Yang Sang-won. In this time of high unemployment rate, the curriculum, system and above all the passion of Yang and his staff at Seelaw Academy can be a role model for many to follow.